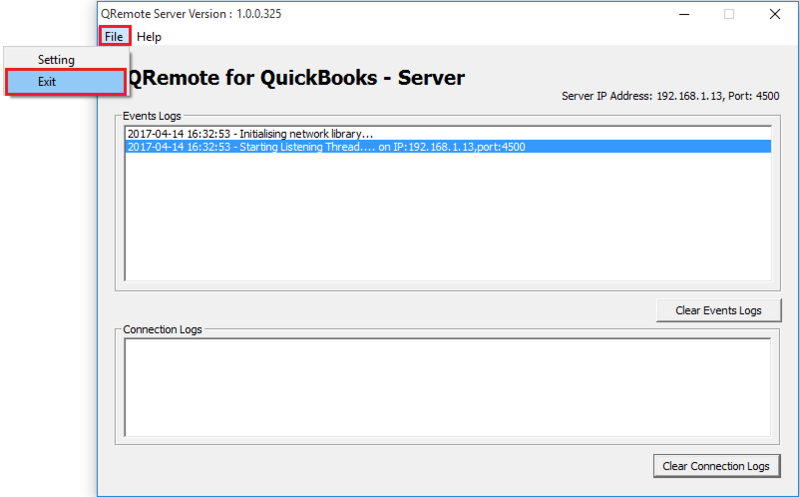 I am using QRemote to access QuickBooks Data & I want to add security when I accessing my QuickBooks Data through QRemote. 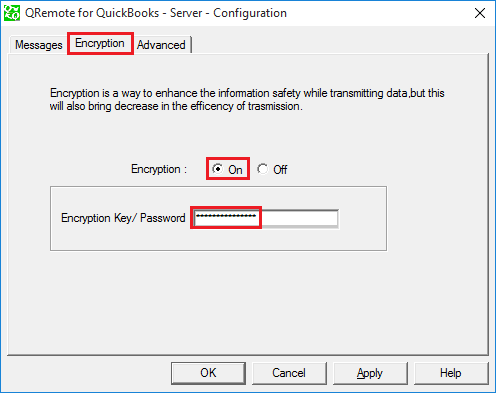 How can I use Encryption is QRemote? QRemoteServer has Encryption feature which will send/receive data between client & server in encrypted format. So you can use this feature. By default, Encryption feature in QRemote is disabled. 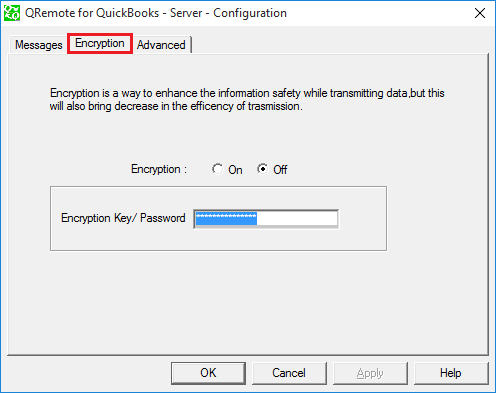 So if you want to use Encryption, You can setup Encryption in QRemoteServer & QRemote Client. First, We will turn on Encryption in the QRemoteServer. You can find QRemote Server running in the System Tray. Double click the QRemoteServer icon from the system tray to maximize the QRemoteServer window. QRemoteServer is running with default configuration. Setting Window will open. Navigate to "Encryption" tab. 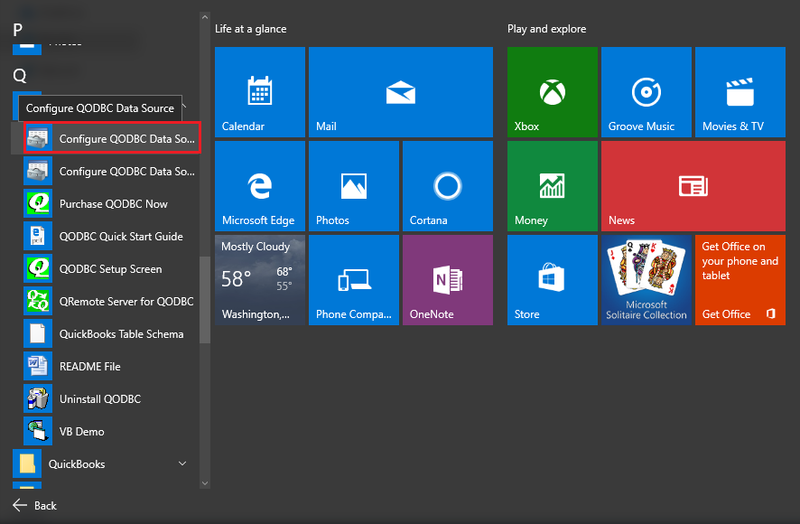 Select "On" option & enter your desired encryption key in the box and click "Apply" button to save the configuration. 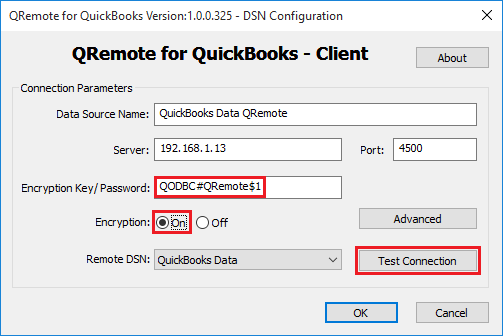 Note: By Default Encryption Key/Password is set to "QODBC#QRemote$1"
QRemoteServer configuration is saved. We need to restart QRemoteServer to load the new configuration. Now we will setup Encryption in QRemote Client DSN. 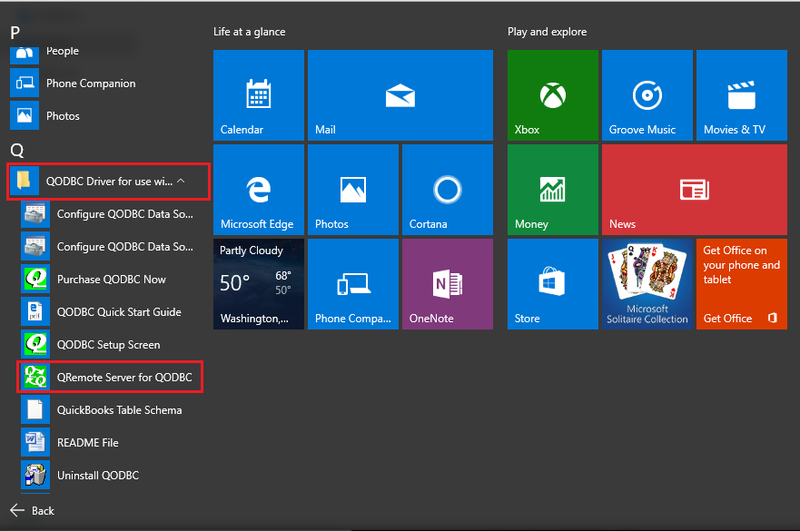 32-bit ODBC manager is opened. 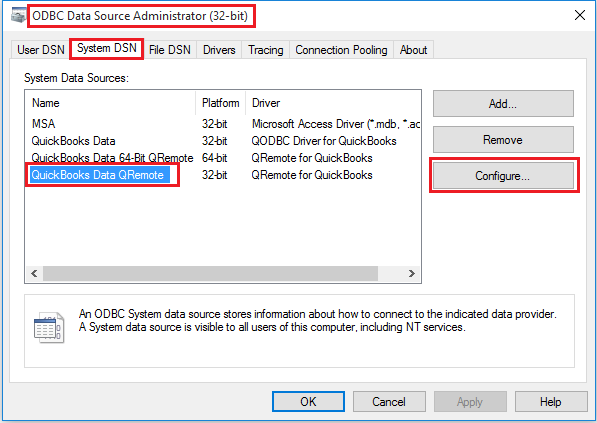 Navigate to "System DSN" tab & click on your DSN and hit configure. 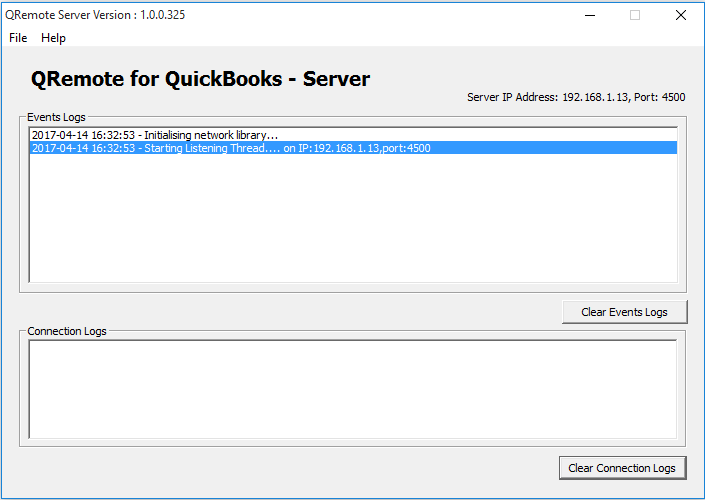 In this tutorial, I am configuring encryption in 32-bit default QRemote Client DSN (QuickBooks Data QRemote). QRemote Client will be open with Default Encryption Key/Password "QODBC#QRemote$1". Enter Encryption Key/Password which you have set up in QRemoteServer. In this example, I have used default Encryption Key/Password "QODBC#QRemote$1". By Default, Encryption is set to Off. To enable Encryption, Select "On" option & click on "Test Connection". If your encryption key on QRemote client is not matched with QRemote Server or Encryption option (i.e. On/Off) is not matched with QRemote Server, then You will receive error "QRemote Client Encryption Key does not match with the one specified on QRemote Server." If you don't want to use the Encryption key, then please set Encryption option "Off" on QRemote Client & QRemote Server. 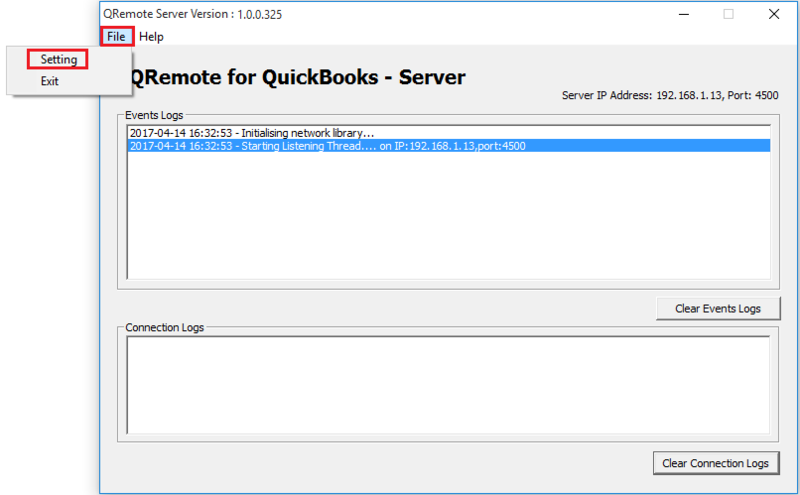 For the past two years I have used QRemote Server and a DSN QuickBooks data. 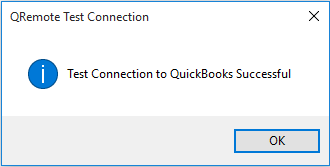 Today for the first time an encryption key/password has appeared in my QRemote for QuickBooks Version 1.0.0.323. The connection works using the key/password automatically provided with Encryption turned off. We have released new security feature in our latest version. So you need to provide the password for QRemote DSN.